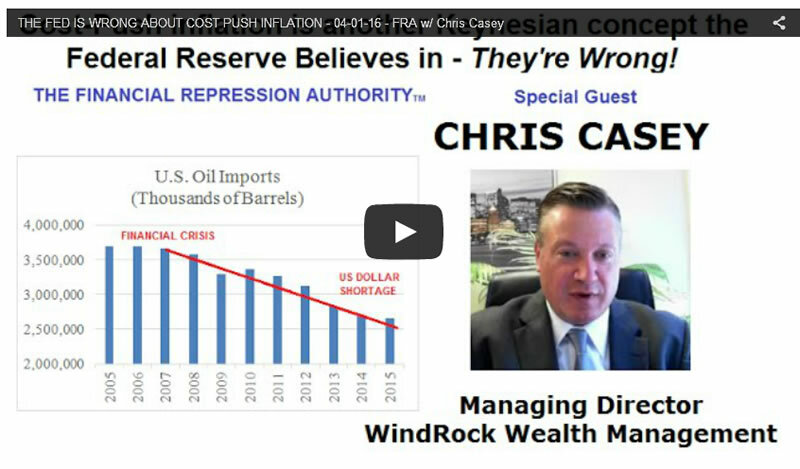 FRA Co-founder Gordon T. Long is joined by Christopher P. Casey in discussing the decrease in oil price and its potential effect on the global economy. Cost push inflation is a Keynesian concept that was developed to explain inflation during inflation; if any important commodity's price rises, all other prices of goods and services rise. As we pay more, the standard of living would go down and inflation would creep in. But this actually puts downward pressure on other goods and services, so in the end the price level itself is largely unchanged. "The price level is a function of the demand and supply of money itself, not of any individual commodity." 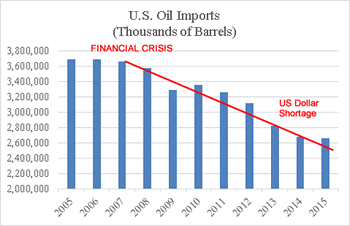 It used to be that minor shifts in the oil price had profound impact on the economy, but that isn't the case right now. Oil went from about $25 in 2003 to $140 in 2008, back down to $30 in late 2008, and $140 a couple of years ago. 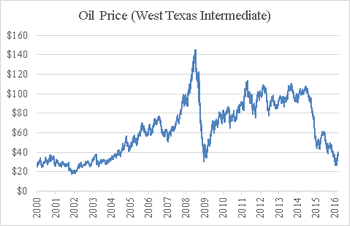 But have we ever seen a price level that rose or decreased according to the oil prices over the last fifteen years? The answer is no. The issue is that the Federal Reserve does believe in cost-push inflation, and they do think that deflation could be caused by lower oil prices. "The great danger here is that they, in their mistaken belief that low oil prices could put a cap on any inflationary moves they do, as far as printing money, is that they could overshoot and end up causing more inflation than they intend." "Lower oil prices are good for the economy, but not for the reasons people cite on mainstream media." There's a possibility that this could spike interest rates, or mitigate a downfall in interest rates. Lower energy prices used to be considered good for the economy, since people have more money to spend. But that's going toward servicing debt; it's not actually consumption, it's going toward debt payments. There are also some real dangers that aren't being discussed by mainstream media. 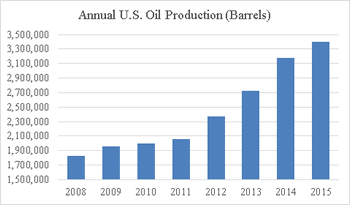 Oil production has increased about 85% since 2008, but what isn't mentioned is how oil imports have decreased. It's down from approximately 12% of total imports to 5% today, not just in Dollar terms but overall volume. The price has dropped 60% in the last five years. 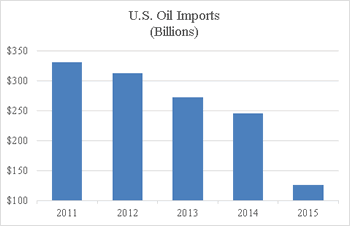 Oil producing nations are making less Dollars from the US customer. This is a problem because there are limited options for what they can do with those Dollars, so the US' major trading partners and oil producing countries hold a massive amount of US treasuries. If they reduce their purchase of US treasuries, that could increase interest rates. "Interest rates would have fallen further, but for the selling or lack of demand from these oil producing countries." The Riyadh is pegged to the US Dollar at 3.75 Riyadh to the US Dollar, but their economy is under strain and their deficit is staggering. In any fixed exchange rate, the only way to keep it is through manipulation of the currency market by active buying and selling of Riyadh and US Dollars, but that is only making them go bankrupt faster. This could ultimately affect US interest rates as well. With multiple countries putting out as many barrels of oil a day as possible, there's pressure to keep the oil supply up and maybe keeping oil prices down. But if the world economy falls off significantly, there will be a decrease in demand and then cut backs and lots of capital not invested. Then if demand rises there won't be much capacity, which makes the market volatile. The banks are holding out in the hopes of a rebound, because they have so much debt outstanding to the oil industry. Eventually this will either create incredible inflation or a banking crisis. "The banks cannot put up with this kind of strain . . . it's kind of like being a patient and your doctor, who would be the central bank, is subjecting you to stimulants and depressants whether its quantitative easing or negative interest rates." Regarding the nature of growth, history shows that the key is a high level of savings and decreasing government intervention. Another is the idea of deflation being bad; for example, the US experienced experienced two 30-40 year periods where the price level fell by half, but it was also the greatest period of growth in US history. The Federal Reserve also has misconceptions about inflation's impact on unemployment, and interest rates, which could cause a banking crisis. If people believe that the oil market will create a banking crisis in the future, then they need to look at assets outside of the banking system. Gold and silver should absolutely be considered as part of their portfolio since it's much safer than a number of currencies, as it has alternative value. Farmland is also an excellent inflation hedge and pays a dividend, unlike precious metals. "A lower oil price, although all things being equal is good, there are some real dangers: there is the danger it could increase interest rates, there is the danger it could increase inflation levels... and there is the danger it could induce a banking system crisis."